All transactions are safe and secure with a reliable history in online purchasing behind each of our associates. 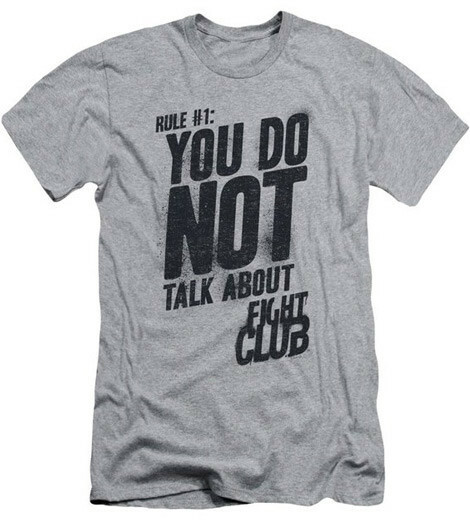 Buy the Do Not Talk About Fight Club t-shirt to own Fight Club clothing and merchandise. Straight from the Fight Club movie to the front of this tee comes the number one rule of Fight Club, as expressed by Tyler Durden, "You do not talk about Fight Club." Brad Pitt's character, Tyler, delivers the quote in the movie, speaking to the Narrator (Edward Norton). The design on this t-shirt immediately conjures memories of mischief, mayhem, and soap. Pair it with the movie poster for the ultimate gift combination. Anyone who has seen the movie will easily recall the Brad Pitt quote on this memorable tee. They might even invite you to a local bare-knuckle brawl. Just don't talk about it. In addition to the Do Not Talk About Fight Club tee above, browse the Fight Club Clothing Gallery for more apparel like men's and women's clothes, kids shirts or hoodies.